A beautiful Maltese sunset seen from the limits of Qrendi in the south of the island. The broad expanse of the Mediterranean stretches in an uninterrupted direction all the way to the Tunisian coast about five hundred kilometres away. 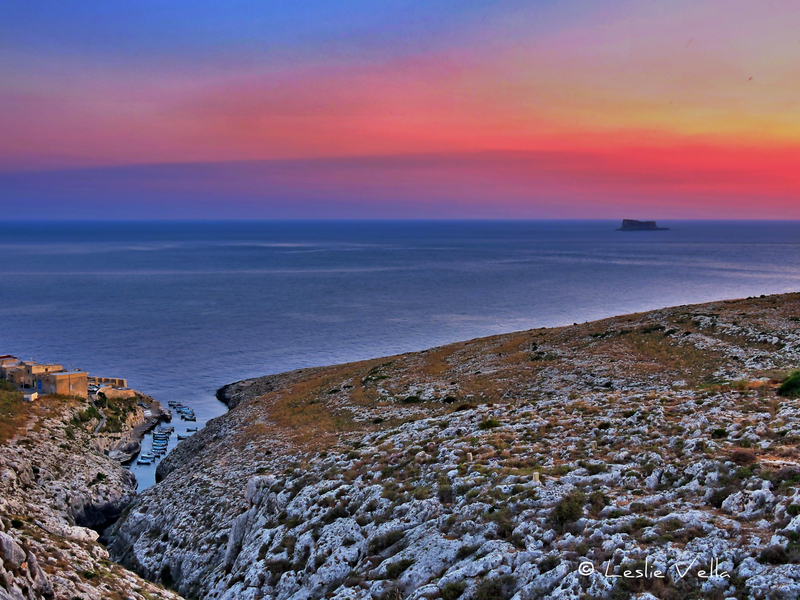 The minuscule islet of Filfla, the remotest of the uninhabited smaller rocks of the Maltese archipelago lies silhouetted against the ruddy hues of the setting sun, its imposing 60 metre high cliffs like standing sentinel against the approaching darkness. The exposed hard layer of coralline limestone karst is almost devoid of soil, its thin layer of organic cover washed into the sea ages ago once the trees which originally bound it to the land were cut. This landscape is far from dead however, supporting rich and aromatic Mediterranean garigue vegetation such as thyme, heather, asphodel and sea squill. At the bottom of the picture, the small and picturesque inlet of Wied iz-Zurrieq, a tiny and narrow coastal indentation providing shelter to the small fleet of boats which ferry tourists to Zurrieq’s Blue Grotto further down along the coast. Many call Wied iz-Zurrieq a fjord and superficially it does give the impression of being a mini version of one, but fjords are carved by glacial ice and glaciers have never featured in the Maltese landscape, not even during the ice ages. It is actually a ria, a submerged river canyon caused when a valley that was originally carved by fresh water on land ends up below sea level either due to a rise in sea level or due to land subsidence. Within a few minutes total darkness will prevail. In the southern Mediterranean latitudes which are ten degrees closer to the Equator than they are to the North Pole, twilight is always brief. Like flicking off a light switch, someone once described it. But until that light switch is flicked off, the ephemeral beauty of the setting sun’s multi-hued light on this beautiful coastal stretch is captured by this picture for all to enjoy. In the middle of last week a good friend alerted me to the fact that, in a particular coastal spot, sheltered under a copse of tamarisk trees, there were a number of specimens of a very rare plant, the Pheasant’s eye. On the following day I rushed to the place, as with such delicate plants there is always the strong likelihood that a bout of adverse weather conditions can very quickly dry up all the specimens of what one is looking for, turning enthusiasm into sheer disappointment. But this time round, luck was on my side. 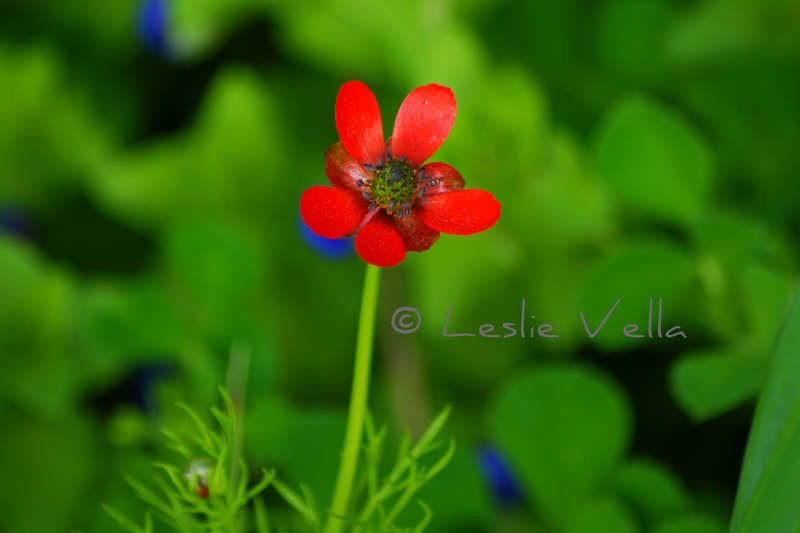 As I traversed the spot, I started looking for the ubiquitous red flowers of the species. This was not so difficult as the prevailing floral colour at this time of the year is yellow with huge swathes of cape sorrel and crown daisies carpeting the thin soil cover beneath the tamarisks. And there they were! A number of individual specimens of the very rare Pheasant’s eye, Adonis microcarpa. The flower the Maltese call Ghajn is-serduq or the Cockerell’s eye, there being no pheasants in Malta. A member of the buttercup family and an indigenous Maltese plant, meaning that it is one of Malta’s original floral species and was not introduced to the island by man. The Pheasant’s eye is an annual species which flowers during the period January to May. It grows in soil-rich pockets of land, mostly near fields although it is sometimes also found on garigue. In Malta, it is classified as rare and is a protected species which cannot be either picked or harmed. Notwithstanding this, this rare but beautiful plant continues to become even scarcer with observed numbers continuing to decline, particularly in the past few decades. So much so, that whenever a few are observed, locations are kept as closely guarded secrets lest they be damaged or destroyed. There is always a joy when one is privileged to observe something which is rare and precious. But there is also the accompanying sadness that the rarity being “enjoyed” is the result of habitat destruction and loss of bio-diversity. Compounded by the even-sadder fact that for most of our decision makers and planners, such richness is rudely and ignorantly clustered into the pejorative label of “weeds”: the Maltese “haxix hazin” or “bad grass”. I am pleased to share with you this particular ray of beauty that I managed to freeze in a photo last week and hope that your enthusiasm and appreciation of such beauty is at least as strong as mine.